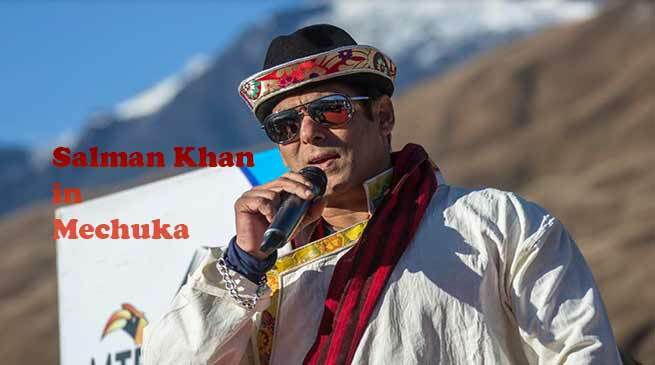 Bollywood superstar Salman Khan today declared open the 6th edition of Adventure at Mechuka festival in presence of Chief Minister Pema Khandu and MoS Home Kiren Rijiju amidst great fanfare. Welcoming Salman to Arunachal, Khandu in his speech thanked the actor for his contribution in promoting tourism in the state in a big way. He also thanked the actor for his presence during the curtain-raiser event for the second `MTB Arunachal Mountain Bicycle Race’ at Mumbai held in September last. Chief Minister said the strength of Arunachal lay in its diversity offering great many unexplored natural paradise and cultures. He said each place in Arunachal has its own unique beauty. He informed that state government has recently signed MoU with 17 private investors and majority of them are related to tourism sector. He expressed hope that with private sectors beginning to invest heavily in tourism sector, Arunachal in future will see exponential growth in this sector. Earlier, Salman flagged in the second edition of the Dalmia MTB (Mountain Terrain Biking) Arunachal Mountain Bicycle race, which was flagged off by Rijiju on November 14 last in Itanagar. About hundred bikers from ten countries including USA, Portugal, Canada, Germany, UK, Nepal and Bhutan took part in the event covering a distance of 650 km. Salman’s magnanimity and pro-bono contribution for promotion of Arunachal as a tourism and film destination was lauded by all present. The Bollywood superstar took part in the 10km bicycle ride from Dorjeeling to Mechuka along with Chief Minister and MoS Home culminating at the festival ground, where they were accorded warm welcome. During the inaugural event, the winners of the MTB bicycle race were felicitated with certificates and cash prizes by the guests. Chief Minister released the 2019 calendar of Adventure at Mechuka.